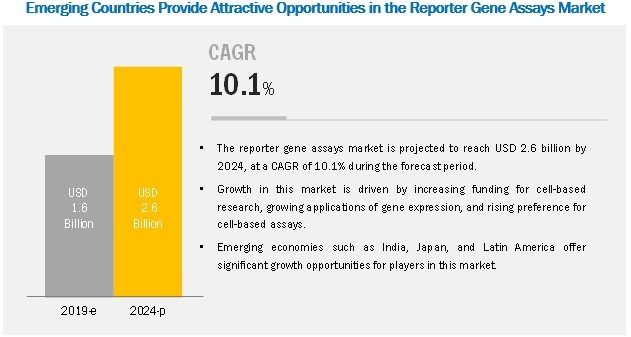 [160 Pages Report] The reporter gene assays market is projected to reach USD 2.6 billion by 2024 from USD 1.6 billion in 2019, at a CAGR of 10.1%. Factors contributing to the growth of this market include increasing funding for cell-based research, growing applications of gene expression, and rising preference for cell-based assays. Based on applications, the reporter gene assays market is segmented into gene regulation, protein interaction, cell signaling pathways, and promotor structural & functional analysis. The cell signaling pathway is projected to grow at the highest growth rate during the forecast period. High growth in this market segment is attributed to its importance in several cellular functionalities (such as cell differentiation, cell fate determination, and cell growth) and advanced applications of cell signaling in life science sectors (such as biotechnology, molecular biology, and microbiology). On the basis of product, the market is broadly classified into assay kits and reagents. The assay kits segment is estimated to hold the largest share of the market in 2019 and is also projected to grow at the highest rate during the forecast period. The large share and high growth rate of the assay kits segment can be attributed to their repeated use in gene expression studies and signaling pathway analysis during gene transcription or translation levels. Moreover, assay kits are preferred over standalone reagents in cases where a validated protocol for assay development is available. The reporter gene assays market in APAC is expected to grow at the highest CAGR during the forecast period. A majority of the growth is driven by the significant expansion of players as well as growth in the healthcare market and research industry in these regions. The low-cost manufacturing advantage, increasing per capita income, and low regulatory stringency are also factors supporting the growth of the reporter gene assays market. The prominent players in the global reporter gene assays market are Merck KGaA (Germany), Thermo Fisher Scientific (US), Promega Corporation (US), PerkinElmer (US), Biotium (US), Abcam plc (UK), Bio-Rad Laboratories (US), Becton, Dickinson and Company (US), Danaher Corporation (US), Geno Technology (US), Genecopoeia (US), InvivoGen (France), and PromoCell (Germany). In 2017, Becton, Dickinson and Company acquired C.R Bard (US). This acquisition advanced BD’s product offerings and global reach. In 2018, Merck opened a new 3,800-square-meter laboratory in Singapore. In 2018, Thermo Fisher Scientific (US) opened its Bioprocess design center in Shanghai. What are the major end users of reporter gene assays? What are the application areas of the reporter gene assays? Which are the most commonly used reporter gene assays kits? What is the global scenario of the reporter gene assays market? Secondary research process involves the widespread use of secondary sources, directories, databases (such as Bloomberg Business, Factiva, and D&B Hoovers), white papers, annual reports, companies house documents, investor presentations, and SEC filings of companies. Secondary research was used to identify and collect information useful for the extensive, technical, market-oriented, and commercial study of the reporter gene assays market. It was also used to obtain important information about the key players and market classification & segmentation according to industry trends to the bottom-most level, and key developments related to market and technology perspectives. A database of the key industry leaders was also prepared using secondary research. In the primary research process, industry experts from both the supply and demand sides were interviewed to obtain qualitative and quantitative information for this report. Industry experts from the supply side include CEOs, vice presidents, marketing and sales directors, business development managers, technology and innovation directors of companies manufacturing reporter gene assay products, key opinion leaders, and suppliers and distributors, whereas, the Industry experts from the demand side include researchers, biotechnologists, R&D heads, and related key personnel. The market size estimates and forecasts provided in this study are derived through a mix of the bottom-up approach (revenue share analysis of leading players) and top-down approach (assessment of utilization/adoption/penetration trends, by product, application, end user, and region). After arriving at the market size, the total reporter gene assays market was divided into several segments and subsegments. To complete the overall market engineering process and arrive at the exact statistics for all segments & subsegments, data triangulation, and market breakdown procedures were employed, wherever applicable. Merck KGaA (Germany), Thermo Fisher Scientific (US), Promega Corporation (US), PerkinElmer (US), Biotium (US), Abcam plc (UK), Bio-Rad Laboratories (US), Becton, Dickinson and Company (US), Danaher Corporation (US), Geno Technology (US), Genecopoeia (US), InvivoGen (France), and PromoCell (Germany).